Robots seem to be everywhere. But what about making coffee? Briggo wants to bring the robotic precision to making coffee, helping to set industry standards for cleanliness and a consistent process. We got to talk with Ian Nater, senior customer service manager at Briggo, about the coffee robot at SXSW and how it honors the hard work of those who cultivate the coffee bean. 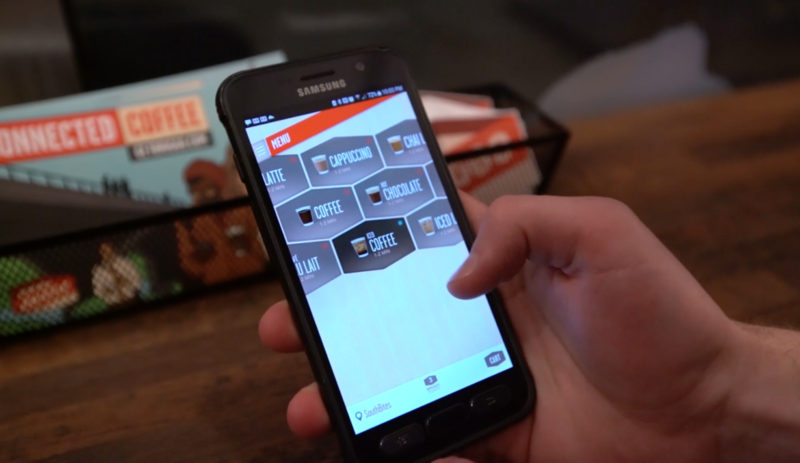 The Briggo coffee robot has the ability to take orders and accept payment in the app for anything for thirteen different drinks including a cappuccino, mocha or Americano (though at the time of writing the machiatto was not an option) that can be fully customized with milk, syrups and sugars. And the best part is that it can be prepared less hot for immediate consumption or super hot so it will be ready to drink at your desk. I was impressed by the cappuccino that I ordered. Clearly, the quality of beans was pretty good and it was cool to watch the robot make the coffee. And it was cool to have the ability to order it in advance and have it waiting for me once I approached the machine. Briggo already has a presence on the Dell and Samsung campus and will be expanding to airports and other large campuses in the near future. While I don’t think that baristas have much to fear in the immediate future, I can definitely see how Briggo has a place in high traffic areas like companies. And with the ability to get a solid cup of Joe on demand with a few buttons, it seems that the future is at hand.